A strange day to announce lenses, but Samyang today announced the 10mm f/2.8 AS NCS CS lens, a rectilinear wide angle lens for crop sensor cameras. It's available in the Nikon F-mount (DX) as well as a number of mirrorless mounts. The lens was first shown in prototype form at Photokina 2012. The DX version has electronic chipping to enable exposure metering on Nikon bodies, but note that the lens is a manual focus lens (10" minimum focus distance). Of note, this lens includes nano coating on the most extreme of the elements. 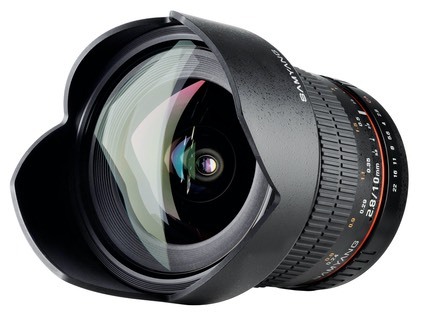 The lens is expected to be available in January, though the US price hasn't been announced yet. UK pricing is 470 British pounds. See the lens data page for more details.